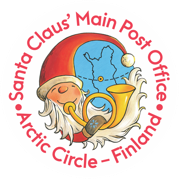 Sara has just entered Santa Claus’ Main Post Office in the Arctic Circle in Finland. She is a sassy 8-year-old girl with a habit of chewing the end of her pen. She also happens to be a detective. Sara has come to Santa Claus’ Main Post Office to solve a mystery: The magic of Christmas and how it seems to spread around the world in letters from Santa Claus. You can tell she’s thinking something really hard; she’s chewing the end of her pen again. “Where does the magic come from? Is it here at the post office?” she asks herself. Sara takes her detective notebook and starts to write. Exciting!!! The first elf sighting ever. The elf has red pants, red shirt, red shoes, red hat. That hat must be felt…But why so much RED? Is red the colour of magic? Sara wrinkles her nose, but decides not to write in her detective notebook the fact she dislikes red. Many adults and children and elves. And yes, it was important indeed my parents would dress up as normal parents. Detectives need to blend in. Sara can’t see Santa Claus himself, but she can see a lot of other things. Elves buzzing around in red, greeting people coming in. A family of two children flipping through the post cards. There’s a big world map on the wall. It has pins on it, marking the places where visitors to Santa Claus’ Post Office come from. So many! From all over the world! Outside snow has covered the ground. There’s a flash of Northern Lights in the sky. In the distance it seems dark, but lanterns and soft lights give the world a magical glow. Snow is cold, white and fluffy. Good for tracking footsteps. Sara looks out the Santa Claus’ Main Post Office’s window. Two reindeers stand in the snow. They seem sleepy. “Are these special postal reindeers, the kind that can fly?” Sara wonders. But she is here at Santa Claus’ Main Post Office to solve a bigger mystery. The magic of Christmas and how it seems to spread around the world in letters from Santa Claus. It all started from a letter she received four days ago. Sara has received letters before, but this time it was different. Four days ago, just before dinner, her parents handed her an envelope. It had a picture of Santa Claus flying through the sky in his sleigh. When Sara opened it and saw the letter was from Santa Claus himself, her parents went all silly. This just happened: My parents started winking their eyes at each other, laughing and singing something about “The Magic of Christmas”. They said the magic of Christmas was inside the letter. How can Christmas fit inside a letter? That has to be magic. And how did Santa know to send it to me? Is Santa manufacturing the magic? Children have the right to know. For five long minutes she chewed the end of her pen. Then Sara walked to her parents and said, “My duty as a detective is to visit Santa Claus’ Main Post Office.” Her parents looked at each other. They had already planned the trip to the Arctic Circle. 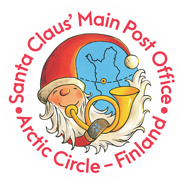 And now, four days later, they are here at Santa Claus’ Main Post Office. Sara has found a good spot for observing the post office and its people. It is warm, happy and red in here. The letter counter is wood. People are gathering around the wooden table to write on letters. Is the magic coming from there? Suddenly she hears a distant thump. Like it came from beneath the floor. “Suspicious”, Sara thinks and places her ear against the post office’s wooden floor. It sounds like someone pushing a big carriage. Someone is carrying something small. The shoes stay still. Sara has her ear against the floor. “We elves are sort of detectives as well. My name is Elli. I’m the Postal Elf. I must say, it is a great pleasure to meet a fellow detective” Elli the Postal Elf continues. Sara is still thinking about her answer – should she admit it or deny everything – when Elli waves Sara to follow her. Sara stands up slowly and hides the detective notebook behind her back. She chews her pen a bit, then glances at her parents. They are toying around with little miniature reindeers. “Well… I guess it’s ok” Sara says to herself, “we detectives are not afraid of adventures and we shouldn’t be afraid to be who we are”. Then she follows Elli. Elli stops at a wooden door. “Do you know that behind this door is our parcel delivery center? It goes all the way under the ground, continuing through corridors and many, many rooms.” Elli the Postal Elf nods at the door. “And this is the secret”, Elli continues. “Perhaps the best-kept secret in the world”. “The magic of Christmas comes from here. Behind that door. Below this floor. Only official postal elves deliver the magic of Christmas and thus, unfortunately, I can’t tell much more as you are not a postal elf. Ok?” Elli says to Sara. “But… In case you’d happen to end up behind that door, you would have to go like this”. Sara writes the instructions in her detective notebook. “And that’s how you’d see all the letters and parcels and where the magic happens. It’s a place where things like family, love, best friends and joy of giving are in the air… a glimmer of the Northern Lights, pinch of snow and Santa Claus’ laugh”, Elli whispers. “But the rest… The rest is a secret”. Sara has drawn also a map while Elli has been speaking. In Sara’s map there’s Santa Claus, snowflakes, elves and corridors and rooms beneath the ground. In the middle of the map there’s a building looking like Santa Claus’ Main Post Office. “Hmm….” She says and bites the end of her pen. Sara turns to look at her parents who are waving at her. She looks at the picture, the letters in the picture, her parents and at the picture again. Then her eyes lighten up. The answer is in there. In the picture she just drew in her detective notebook. The map of the Magic of Christmas. And now she knows what to do. “The letter I got from Santa Claus made my parents very happy. I think it was because of the magic. But… They didn’t even get one themselves. That letter was for me”, Sara whispers. She takes a little pause. She clears her throat.